Defense secretary says accelerated recruitment hastening end of "stop-loss"
WASHINGTON (CNN) -- The military will phase out its "stop-loss" program, the contentious practice of holding troops beyond the end of their enlistments, for all but extraordinary situations, Defense Secretary Robert Gates announced Wednesday. 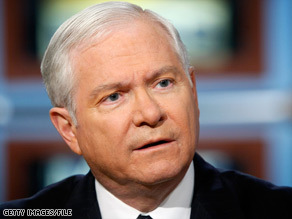 Robert Gates said the Pentagon will pay a $500-per-month bonus to troops whose tours have been extended. Gates also announced at a wide-ranging news conference that the Defense Department will pay for families of fallen troops to travel to Dover Air Force Base in Delaware to be present for the return of their deceased family members. The decision to phase out stop loss by 2011 comes in combination with an announcement that soldiers affected by the program will receive a $500-a-month bonus while they are in extended service. Currently, the Army is the only service that uses the stop-loss program. As of January, 13,217 soldiers had tours extended under the stop-loss policy. Gates said the change is one he has wanted to implement since he became secretary of defense. "While these changes do carry some risk, I believe it is important that we do everything possible to see that soldiers are not unnecessarily forced to stay in the Army beyond their end-of-term-of-service date," Gates said. The stop-loss program was put in place to ensure units remained intact during deployment. For those whose enlistment was due to end, tours of duty could be extended in the middle of their unit's deployment. The Army used the stop-loss policy during Operation Desert Shield in 1990 and reinstated it after the September 11, 2001, attacks. Gates cited two factors as contributing to the end of the program. First, he said, "We will be drawing down in Iraq, over the next 18 or 19 months, significantly more than we are building up in Afghanistan, in terms of the Army." In addition, the Army has more troops to call on. Retention and enlistment are up, Gates said, and the service has reached its goal of 547,000 personnel sooner than expected. The defense secretary would not talk about details of the White House's review of Afghanistan strategy, being conducted by the Defense Department, State Department and the White House, but he did said it has not been easy coming up with a promising new strategy. "It's a difficult problem and trying to come up with new approaches and new initiatives that enhance our prospects for success is hard work," he explained. He admitted that he has been "uncertain" about the proper direction for the Afghanistan strategy. "I've been very concerned about an open-ended commitment of increasing numbers of troops for a variety of reasons, including the size of our footprint in Afghanistan, and my worry that the Afghans come to see us as not their partners and allies, but as part of their problem," Gates told reporters. Gates defended the continued hunt for Osama bin Laden, and suggested the expectation that bin Laden could be easily found is unrealistic. "I think too many people go to too many movies. Finding these guys is really hard, especially if they have some kind of a support network," Gates said. "We have, I think, done some serious damage to al Qaeda over the last number of months. And everybody continues to look for number one and number two." Gates also announced he is recommending to the president that he renominate Adm. Michael G. Mullen for a second term as chairman of the Joint Chiefs of Staff and Gen. James Cartwright as vice chairman. The announcement about funding the trips to Dover comes as the Pentagon prepares to allow the media to record the return of fallen troops from overseas, if the families of the troops permit it. The media has been prevented from doing so since 1989. "We are committed to seeing that America's fallen heroes are received back to their loved ones and their country with the honor, respect and recognition that they and their families have earned," Gates said. He briefly talked about his own trip to Dover earlier this week, getting emotional as he described going to the back of the plane carrying the coffins. "I went to the back of the plane by myself and spent time with each of the transfer cases," he said, his voice beginning to choke up. "I think I'll stop there."